An outbreak of powdery mildew is hitting lilac bushes and other plant species in the China Gardens neighborhood in Hailey. The infestation is made up of several species of plant fungi that have taken advantage of humidity to propagate. McCammon came to Hailey on Tuesday to meet with about a dozen residents and arborists to address a problem first brought to light last week by China Gardens resident Maggie Springer. The Springer family’s 29-year-old lilacs appeared to be struggling and were covered in what appeared to be a fungus under their leaves. 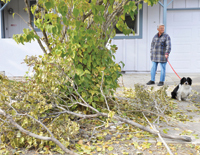 “It was hitting the lilacs and aspens worst,” said Springer, who contacted master gardener and West Magic Resort owner Don Hartman to find out. Hartman drove to Hailey and collected samples of leaves and branches, and soil samples, in order to diagnose the problem. Hartman found on Springer’s property powdery mildew fungus spores and Witch’s broom (another fungus), which makes leaves mangled and scraggly. He then contacted McCammon through the University of Idaho Extension office in Hailey. McCammon came to China Gardens on Tuesday to see firsthand what was going on. He took a tour around the neighborhood and discovered fungal infestations on several different types of trees and plants, including fruit trees and garden plants. McCammon said an especially humid event, such as the persistent rains that drenched the Wood River Valley in August, may have precipitated the outbreak. He said smoke from recent fires may also have created enough humidity. McCammon said he heard reports on Monday of powdery mildew in Bellevue. One way to avoid fungus growth would be to not plant fungus-susceptible plants in the shade, McCammon said. “Larger shrubs, like lilacs, should be thinned out for more air movement. Plants create their own humidity simply through respiration,” he said. McCammon said fungus spores can remain dormant for up to 10 years, until high humidity in summer once again starts their one-year life cycle. Organic treatments for powdery mildew contain sulfur and copper, McCammon said. He said Immunox or other retail chemical treatments are also available.